I have a book published in the 1960s titled ‘Queen Victoria’s Little Wars’ which clearly demonstrated the futility of going to war in Afghanistan. We never learned. 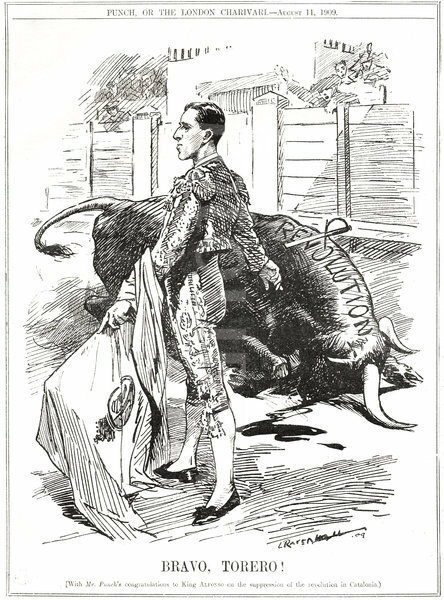 This is a Punch cartoon congratulating King Alfonso XIII of Spain for brutally putting down a Catalan revolt in 1909. This week representatives of King Felipe VI of Spain brutally put down a Catalan plebiscite in 2017. Tragic Week was the name used for a series of violent confrontations between the Spanish army and Catalonian radicals during the last week of July, 1909. Civil guards and police shot at demonstrators in Las Ramblas, resulting in the proclamation of martial law. The Spanish government sent in the army. Barcelonan troops refused to shoot their fellow citizens and so troops were brought in from outside; they put down the revolt after killing dozens of people. General European condemnation was immediate, unlike in 2017. But we have learned that however tragic the news, there’s probably something in the fotoLibra archive that referenced it years ago.